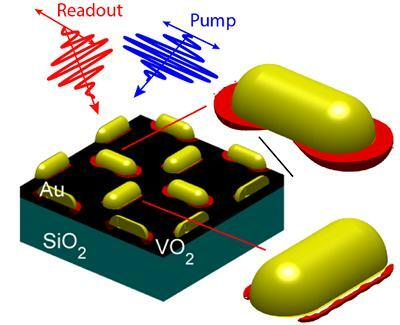 Gold antennas with antenna-assisted phase transition (red). 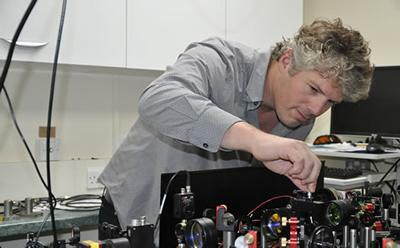 The Southampton team used the properties of the antenna itself to achieve low energy optical switching of a phase-change material. The material used to achieve this effect was vanadium dioxide. Vanadium dioxide is a special material with properties that can be switched from an insulator to a metal by increasing the temperature above the phase transition point (68 °C). Fabrication of this material is challenging and was produced by a team at the University of Salford, who specialise in thin-film deposition and who were able to grow very high quality films of this material.